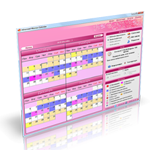 OvulationCalendarSoftware.com is project by SoftOrbits shareware company. SoftOrbits was created in 2006 to develop software and services for home users. By focusing on several products, directing our efforts towards its development and support, and minimizing corporate overhead, we deliver maximum value to our customers. Our goal is to create convenient, high-performance, and most effective software and services. Hundreds of thousands of people using our software have made the right choice.